Huntington Beach, CA, February 10, 2018 --(PR.com)-- Roy E. Smoker of Huntington Beach, California has been honored as the Biography of the Year for 2018 and as a Professional of the Year for two consecutive years, 2017 and 2018, by Strathmore’s Who’s Who Worldwide Edition for his outstanding contributions and achievements for over 46 years in the field of defense. Dr. Smoker is the CAED of MCR, which is a defense contractor providing strategy and solution services to customers including the U.S. Defense, Civil and National Security Departments and Agencies, leading companies in the aerospace and defense industrial base and related organizations in the international arena. He liaises and interacts with defense contractors regarding military budgets. Dr. Smoker is a Cost Analyst for new systems and new technology. Born on December 7, 1943 in Richmond, Indiana, Dr. Smoker obtained a Ph.D. in Economics and Public Finance from the University of Missouri, Columbia in 1984. He retired from the U.S. Air Force after serving 30 years. 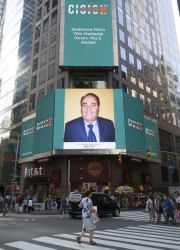 He was recently recognized on the Reuters Billboard in Times Square in New York City. In his spare time he enjoys tennis.